Fall is here, y’all. 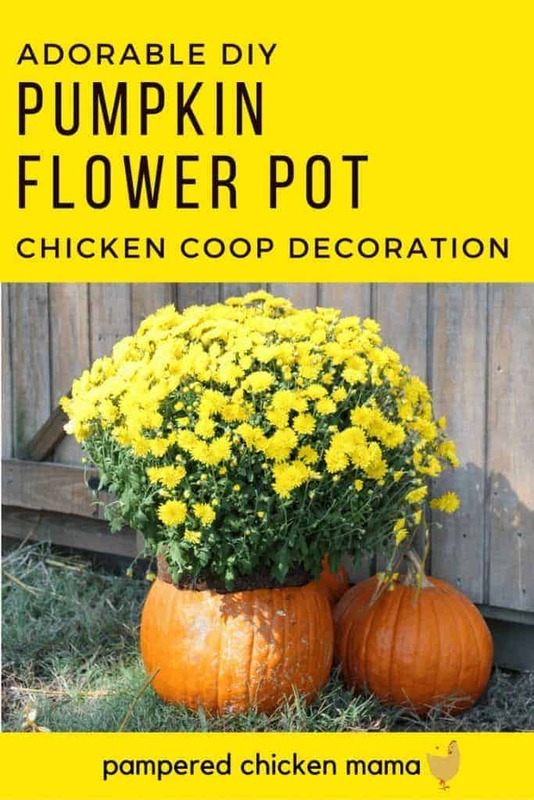 And that makes it a perfect time to decorate your chicken coop with a cute fall display of pumpkins and mums. Step 4: Stick the flowers in the pumpkin, and you’re done! Why decorate your coop? Well, certainly you don’t HAVE to. But it looks kind of cool, and if you do it right, you can recycle your fall decorations as healthy treats for your chickens. Here on the farm, I like things to multitask. And that includes decorations. So that’s why I love making flower pots out of pumpkins. It looks good – and when you’re tired of the display, your hens can eat the pumpkins AND the mums. We’ve done the whole “a coop is just a coop” thing here on the farm, and while that’s fine, things just look better when they’ve been given a bit of color. It’ll cheer you up, and enhance your flock’s surroundings and give them some environmental stimulation. 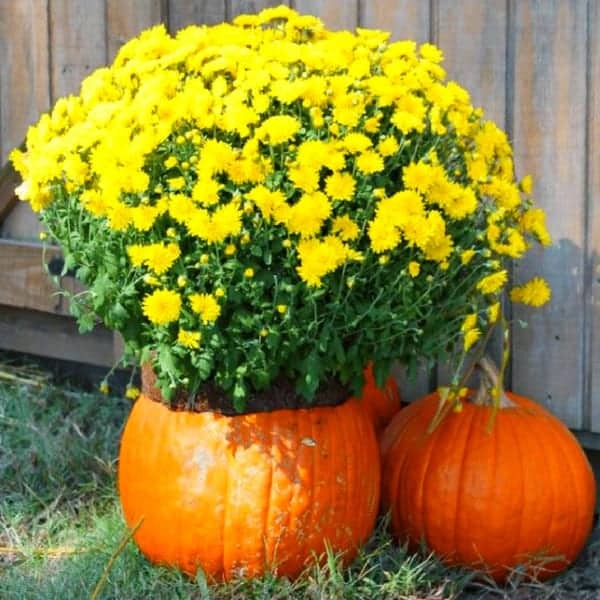 So in this article, I’m going to show you how you can make a living flower pot out of a pumpkin and options for flowers that are edible for you and your flock. So, this is pretty simple, and if you’ve ever make a jack o’ lantern, you can carve out the pumpkin without much instruction. Something to note is in the video, I used a kitchen knife. Someone on Facebook pointed out a jigsaw would have been a better choice – and they’re right. Avoid the mistake I made and use something electric. That being said, it didn’t take very long nor was it very hard to carve the pumpkin using a knife, so if that’s all you got, then it’ll still work great. It goes without saying that you should use a pumpkin that’s big enough to house the flowers you plan to pot in it. While this seems pretty obvious, I point it out because the pumpkin innards are GREAT chicken treats. (Find out why pumpkin is so healthy for chickens right here). You’ll hear scuttlebutt that pumpkin seeds are natural dewormers. While there’s really no evidence that they’ll keep your flock parasite-free, they’re healthy for your flock. So they might not do much for parasites, but they’ll DEFINITELY do something to help your flock be healthier – and happier, because hens love treats. Feed the pumpkin and the seeds raw – don’t roast and definitely don’t salt the pumpkin seeds. Chrysanthemums are the traditional fall flowers used in displays, and luckily, they’re healthy for chickens to peck at. Just be sure you source organically grown flowers, or at least those not exposed to pesticides. Other options are calendula or even herbs that have started to flower. It’s up to you. For this project, I used chrysanthemums because they’re readily available. This isn’t a hard project, but it’s one you and your hens will both appreciate. Once you’re done with the display, as long as the pumpkin isn’t rotting or moldy, you can pass it on to your hens – who will love you for it! I’m trying my luck with a question for you on a topic I haven’t seen much. I have a backyard mini flock (3 chooks) that until recently, seemed quite content to wander around my back yard under constant surveillance; when I can’t keep constant eyes on them, they’re allowed to roam in a much smaller run that is connected to their coop (complete with food and water and their nesting boxes). My yard is in the middle of a busy city and is surrounded on 3 sides with a fence that’s about 5 feet high minimum. However, the one side is a different style of fence that is maybe 3 feet high. The other day, I had a surprise when I ran into the house quickly to get something just inside the door and upon my return, I saw one of my ladies teetering precariously on the smaller fence. She came when I called, but I realized that with this new discovery, she (and her flock mates) might try to check out greener pastures so to speak. I am planning on extending the height of this fence, but I was also pondering the utility of clipping their wings. As it stands right now, they can get some respectable height when they want and I was wondering if a clip might curtail this? What do you think? If you think this seems like a feasible plan, do you have recommendations on the best way to go about doing the procedure? I’ve read some web sites, but I don’t feel comfortable with the little information they provide. Any advice you might have would be greatly appreciated!Thank you very much!